Today, we’re talking about how some of our favorite video games have tons of math included. There are a lot of “math games,” especially web-based ones. I’m not opposed to those, but if you have a math-hater, math facts with circus animals are still math facts, you know? The thing is, we’ve realized that the games that Sarah LOVES playing most have a huge math component. Lego Star Wars – This whole series is for the DS, Wii, Xbox and Playstation systems (and includes Lego Pirates of the Caribbean, Lego Batman, Lego Lord of the Rings and a bunch more) is a TON of fun for Lego-loving kids like mine. And guess what? You break bricks and collect coins. You use those coins to complete various challenges. And that means keeping track of the coins, as well as working on your logic and critical-thinking skills, which are a key part of real-world math! Club Penguin – Sarah loves this web-based game, probably more than any of her others. It’s got a “mission” or “quest” format that you unlock progressively, which keeps the kids coming back, and to unlock various parts, players need to complete challenges. Many of them? Yep, math-based. There’s also a money component here, where you need to save up to buy igloo upgrades for your penguin’s domicile and, you know, cool penguin clothes. Moshi Monsters and Webkinz – I mentioned these for creative play yesterday, but both have a significant math component as well. They have logic games, mini-games that are actually straight math-based (like Moshi Multiply, oddly one of Sarah’s favorites) and, as with Club Penguin, a significant money component that leads to all sorts of adding, subtracting and more! Nintendogs and Cats, Pet Vet and Horsez – Again, the money component of these games is key. More so than in some other games, Pet Vet in particular requires you to really work for the coins to then buy upgrades, and there’s a lot of logic required about what upgrades you spend money on. Buy a horse stable and you can care for horses (and make more money), but you’ll have to spend a good bit up front. These are some longtime favorites of ours for science as well, again especially the Pet Vet ones! Rush Hour – This app is based on a board game, and we have that version as well. We play it more on our phones, though, because it’s great for something like passing time in a waiting room or in line! It’s a logic puzzle based on getting a particular car out of a well-packed gridlock. These are just some of the games WE play. My challenge and encouragement to you is to look for the math in the games your own family enjoys, and, without being heavy-handed (there’s an art to that! ), to discuss it. If you’re laying Minecraft tiles, be overt in talking about how you’ll use 20 tiles to make the floor of your house, and if you can, work in that there are four rows of five tiles. If you play Roblox, same idea. I talk a LOT about real-world math and logical thinking, because I truly believe if you get the idea, you’ll be able to get the “math facts” down without issue! 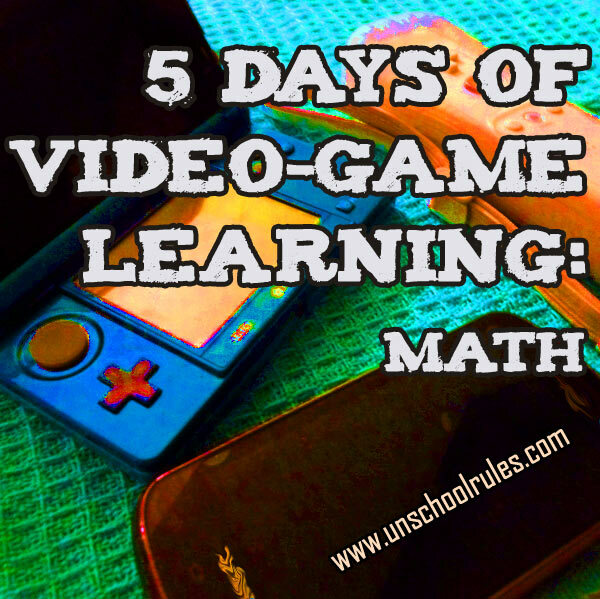 This entry is about math, unschooling, video games. The previous post was Virtual friends, virtual art: Video games for social skills and creativity. The next post is Pixels and punctuation: Video games for writing and spelling. These are great! I am going to look for that lego game. My girls used to play Club Penguin…maybe I can convince them to again? Lately they are all about Minecraft. But math is our most difficult subject, we need all the help and fun games we can get! Theresa, Minecraft is GREAT too! I’ve found that when Sarah and I are playing then together, we have these cool math- and logic-themed discussions, though I’m not sure she sees those things on her own quite yet. Ooh, I don’t know about Prodigy, I’ll have to check that out! !